For the longest time, the photo above haunted me. Not in a bad way, but it is such a damn freakin’ awesome serious Don’t-Screw-With-Me look with the gun and the target pattern. And I had no idea for the life of me what film or tv show it was from! The image was even available on t-shirts and mugs and such through Cafepress on Culp’s official website but there was nothing noting what it was from. Well, dang! I had no idea there had been tv movies with the Shaft character. I certainly knew of the original film, which is one of my favorites. 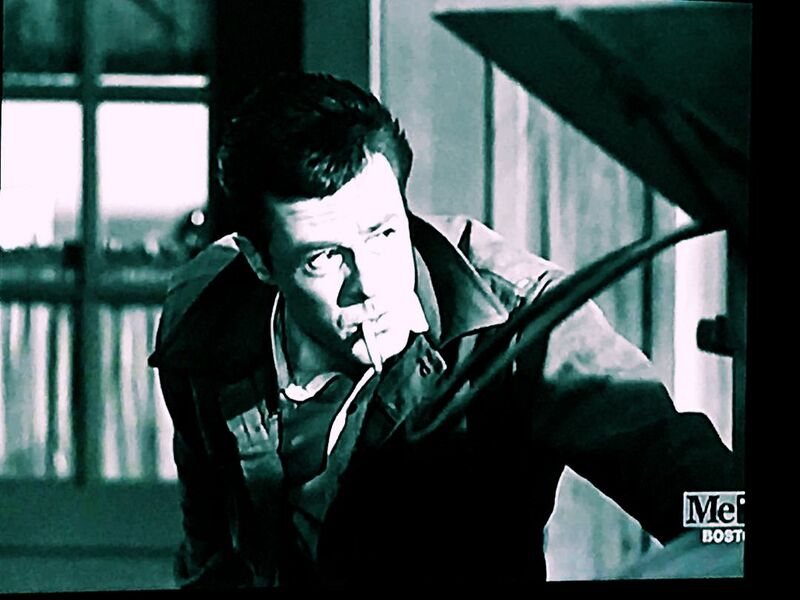 But damn, I thought, Culp in a Shaft-esque tv movie? I gotta see this! Alas, that was easier said than done. Until the nice folks at the Warner Archive put the 7 Shaft tv films out on a DVD set. 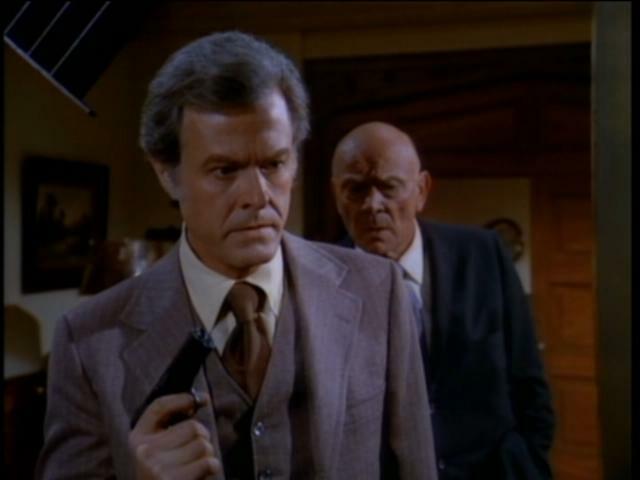 The episode, actually known as “The Executioners” was the first of the series. 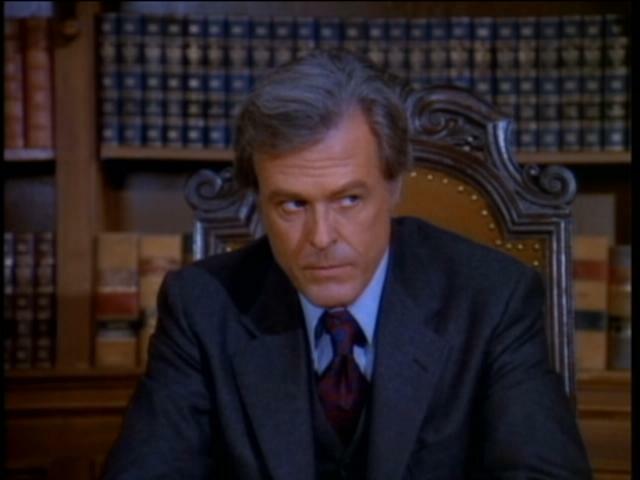 Robert Culp plays Marshall Cunningham, a well-heeled attorney in New York City. His wife was sexually assaulted and as a result has been confined to a hospital. The man who assaulted her was found not guilty but was eventually killed. Meantime, the city has seen a series of unusual deaths over the past several months. Our story begins when defense attorney Charles Dawson (Noah Keen) and his client (Rafael Campos), who was just acquitted, are abducted while leaving the courthouse. They’re held for at least 8 hours and are then brought before a group of men in a finely decorated office, neither of them having any idea why. Turns out Mr. Cunningham has put together a modern day posse, a vigilante task force if you will, comprised of several upstart citizens, including a former judge, a police officer and other distinguished members of the community. Their “court” charges, tries, convicts and sentences criminals who have otherwise evaded the justice system or had the good fortune to fall through its cracks. Justice delivered by Mr. Cunningham’s procedural is swift and final. There is no appeal, no parole and no jail time. The sentence is always death. Killing a defense attorney, however, was a first and would be a costly mistake. 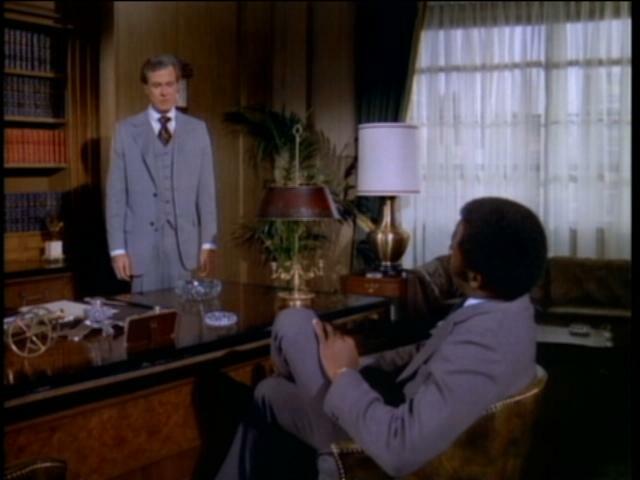 The death of Attorney Dawson draws the attention of private investigator John Shaft, an old friend. Dawson had helped get Shaft started in the business. 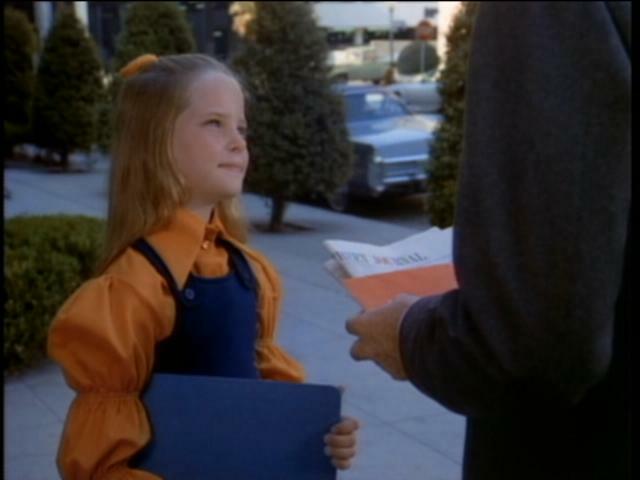 Meantime, we see a little more of the life Marshall Cunningham, who lives in a stately New York high rise with his 11 year old daughter, Cathy (Melissa Sue Anderson). He drives his daughter to school because the streets are not safe (certainly, after what happened to his wife he is very protective of his daughter). Most of Cathy’s friends walk to school and she wants to as well, but father says no. As they wait on the sidewalk for his car to be brought around, she hands him an envelope with a note for her mother to take with him when he goes to see her. After dropping his daughter off at school, Marshall goes to see his wife. 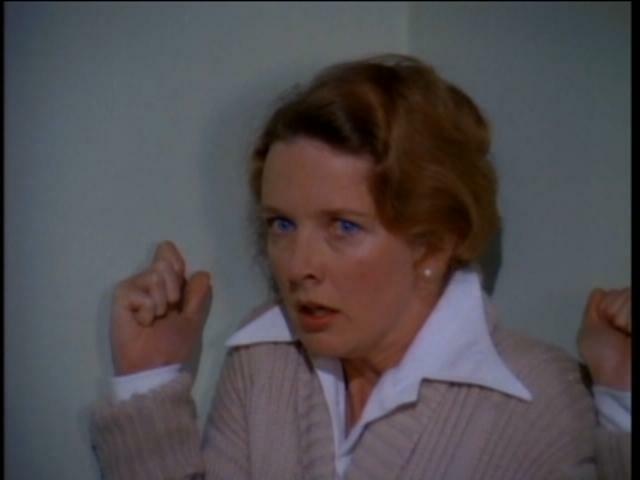 Jane Cunningham (Barbara Babcock) is very disturbed after what happened to her and reacts extremely even to the sound of a man’s voice (even own her husband’s). She cowers in the corner and he makes no sudden moves and speaks softly to her, leaving the envelope from Cathy on the bed. 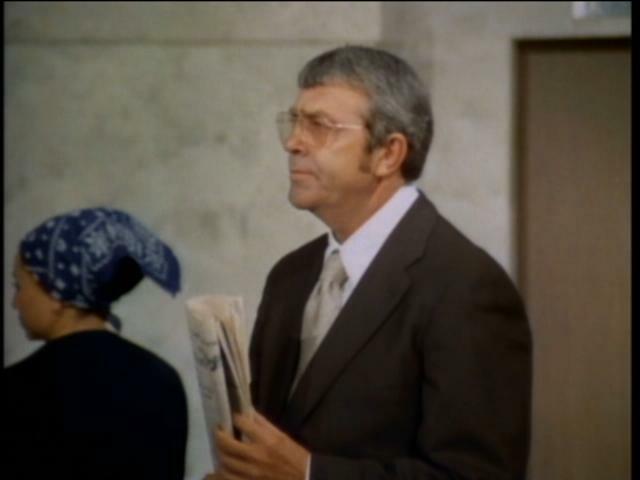 The whole scene is tragic and Culp’s facial reactions as Cunningham show that the sight of his wife in a such a state, although he’s seen it probably day in and day out since the incident happened, kills him every time. He leaves quietly, giving a glance skyward as he goes out the door, hopeless that she’ll ever improve. At the next meeting of Cunningham’s tribunal, they discuss new business. Dr. Walter Anderson (Maurice Hill) shows a recent feature from the newspaper about a man who boasts of controlling a large percentage of the city’s prostitution and yet has not been convicted or arrested for it. The tribunal agrees, unanimously, that the pimp should not be allowed to continue. Cunningham asks Anderson to do some homework on the pimp, determine his patterns and routines and with that information, Cunningham would do the pickup. Shaft has been doing some homework himself, researching the backgrounds of the murder victims (all of whom were criminals of various degrees) and digging deeper by looking into the families of the people who had been victimized by the murdered individuals. Among those on his list: Marshall Cunningham. Shaft finds out that the man accused of attacking Mrs. Cunningham, although found not guilty, was found dead two days after his acquittal. Cunningham acts surprised to learn of this and says he’s sorry to hear of it. He explains to Shaft that he feels that criminals are people who are sick and need help, not punishment. Shaft finds this just a bit hard to believe coming from a man whose wife was sexually assaulted. Cunningham has an answer for this too, explaining that Jane has had problems since the birth of their daughter. Cunningham is cordial to Shaft and all but it’s clear after Shaft leaves that the detective is starting to get too close. 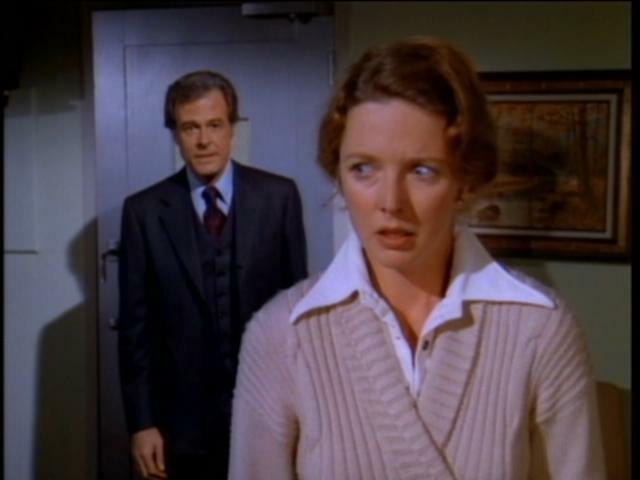 After meeting with Cunningham, Shaft goes to the hospital where Mrs. Cunningham is confined. He asks to speak to the doctor in charge. Turner’s guy that’s tailing Shaft phones Turner to tell him. Turner tells him to dump him. As Shaft leaves the hospital, he’s shot down by Turner’s tail. The man is identified by a witness but is conveniently shot and killed by Sgt Turner who was sent to pick him up. 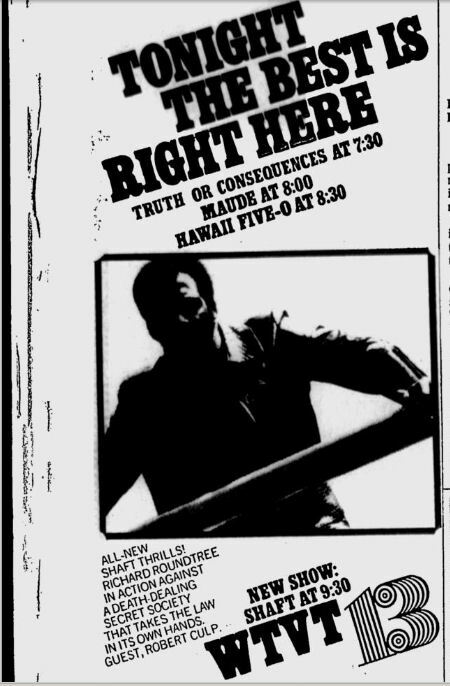 After two weeks recovering from the gunshot wound, Shaft is back on the case. He finds out more about Cunningham, who not only is a senior partner in a law firm, but also serves on several boards for various corporations, chairman of a bunch of charities, honest, trustworthy and reverent. The original Mr. Clean. 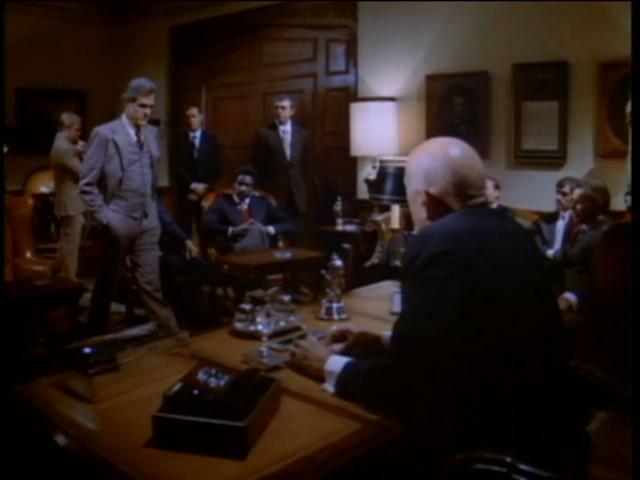 Shaft also learns that Cunningham served in the military, obtaining the rank of Colonel and serving in the Judge Advocate’s branch. 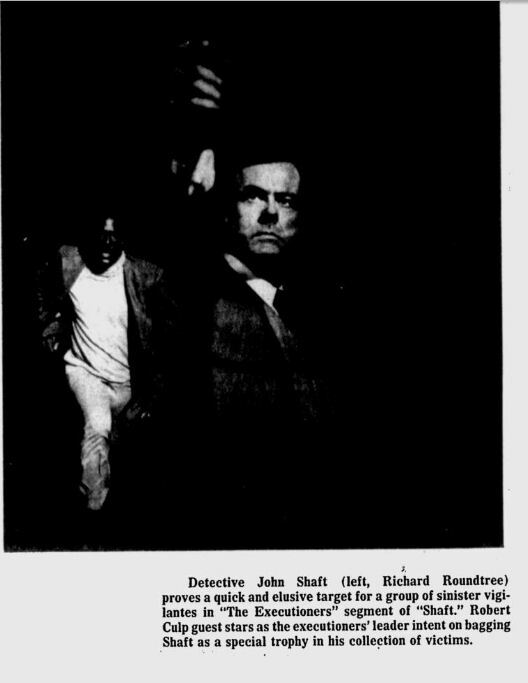 Shaft stakes out Cunningham’s residence and tails him when he’s picked up by someone (looks like Bill Hickman). 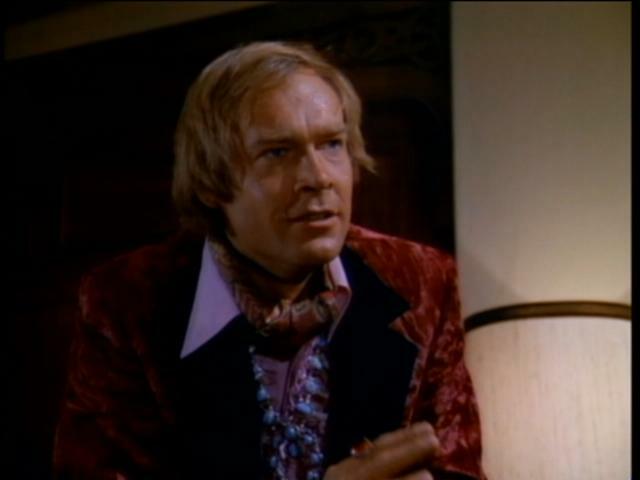 Cunningham is dropped off somewhere in midtown and he sneaks into the backseat of the pimp’s Rolls Royce, waiting for him and then pulling a gun and telling him to drive. 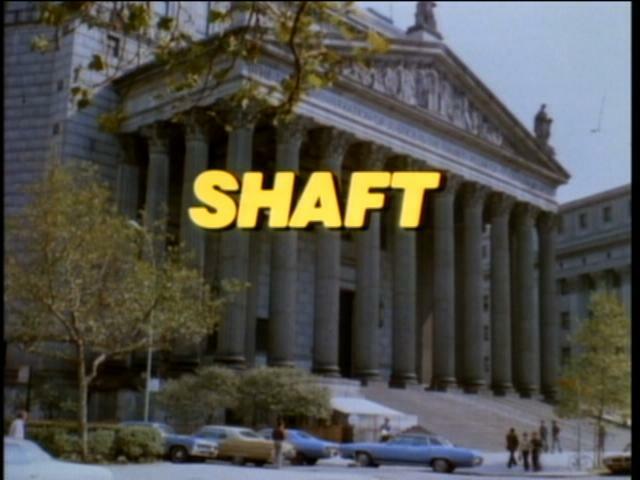 Shaft follows them to the athletic club where the pimp, Mr. Fell (Kaz Garas) is taken inside. Shaft sneaks into the building. Mr. Fell, meanwhile, is placed on trial by Cunningham’s task force. Shaft hears the voices and follows through the club to find where the men are meeting. He finds the room and listens, hearing the names of the impaneled jury. We never hear what the defense argument is as it’s presumed to take place when Shaft leaves his listening point to find a phone and call Lt. Rossi at home. Shaft makes a second phone call in the meantime to Sgt. Turner, telling him he’s busted the Dawson case wide open and to get down to the athletic club with some back up. When Shaft goes back to the room where the trial was being held, he finds it empty. The task force is escorting Mr. Fell to his execution. When they bring him into the firing range, he screams. The pimp is shot before Shaft can get to them but he busts in anyway. Shaft’s upper hand is short lived however when Turner shows up. Certainly not wanting Shaft to expose what they’ve been up to, they put him on trial. His charge? Murder. Since the “court” previously held that Attorney Dawson carried the blood of his client’s victims on his hands by working to free his clients from conviction, Shaft, therefore, became an accessory having used his investigative skills to assist Dawson. 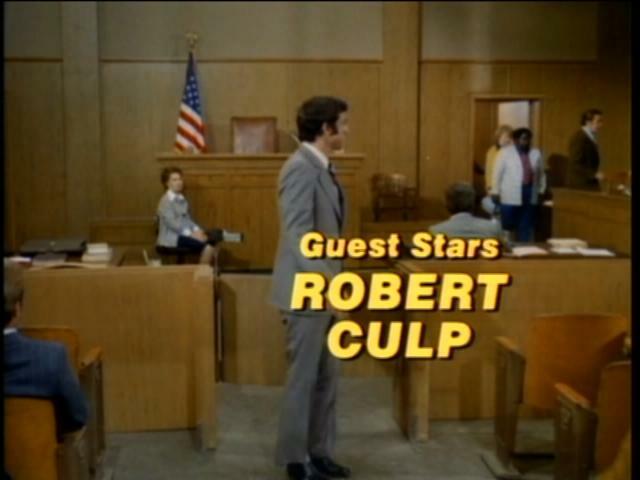 I gotta admit, although the whole concept of this tribunal borders on the absurd, Culp is totally convincing here as the prosecuting attorney. Shaft speaks in his own defense and calls the tribunal for what it really is, nothing more than a bunch of a vigilantes. He can understand why Cunningham is part of it all, but he doesn’t figure every man there to have a wife who was attacked and in a hospital. Nonetheless, he’s found guilty. He slugs the nearest guy to him though before they can lead him out of the room and he tells Turner that he had phoned Rossi. Turner doesn’t believe him and even if Rossi was on the way, Turner figures Rossi won’t have much of a case without Shaft’s testimony. 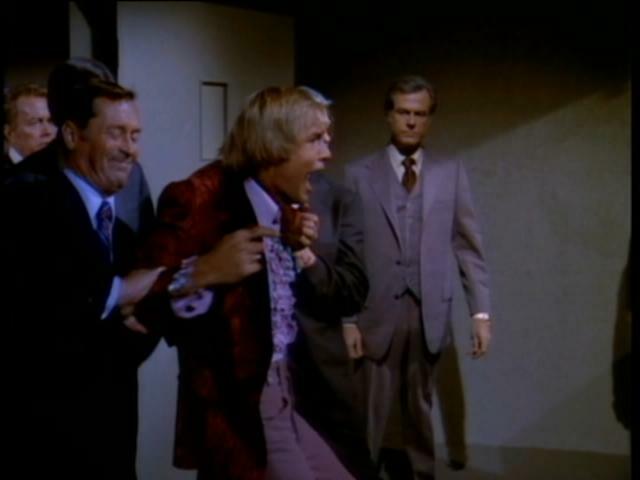 Before he can be lead out of the room again, Shaft pushes one of the henchmen (Bill Hickman) and dives through a window that overlooks the athletic club’s indoor swimming pool. 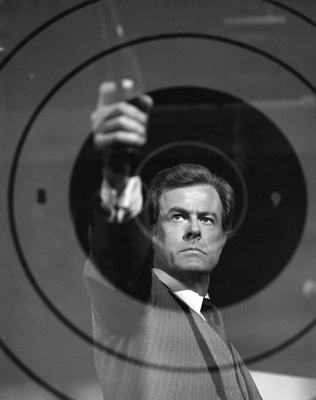 Cunningham is the first one to the window – with a gun. He fires a few shots at Shaft as the detective is getting out of the pool but misses. Not so minor continuity error here: After escaping the court by diving into the pool, Shaft must’ve been running pretty fast because his clothes are bone dry. 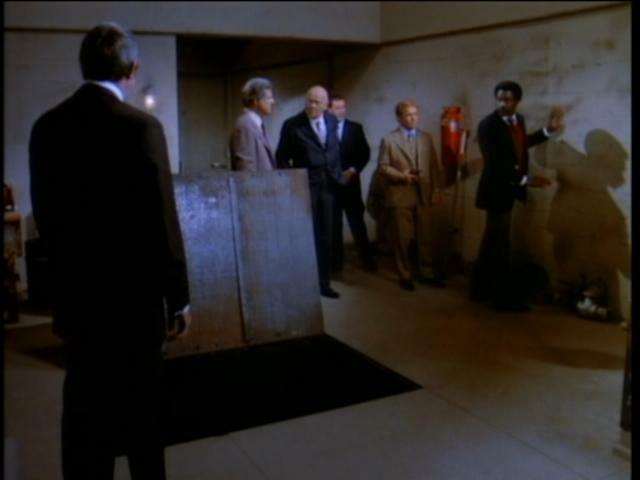 Cunningham shows Shaft the “garbage disposal” as they dump the pimps body into the opening in the floor. Eighteen blocks away it empties into the river. Turner tries to push Shaft into the opening but Shaft grabs Turner and throws him in instead. And at this point ladies and gentlemen is where Marshal Cunningham finally cracks. He pulls his gun, completely crazed and is stopped only by Judge McCormack from shooting Shaft. One of the henchmen picks up a shovel and readies a swing at Shaft when Cunningham says “No!…let me do it…” He’s nuts by this point. Crazed. He picks up the hook used to open the floor gate, clanging it on the open door and slowly coming around after Shaft. He even gives Bill Hickman a gentle push to the side. He takes a few swings at Shaft and misses and Shaft manages to grab hold of the hook and turn it on Cunningham, practically wrapping it around his neck. 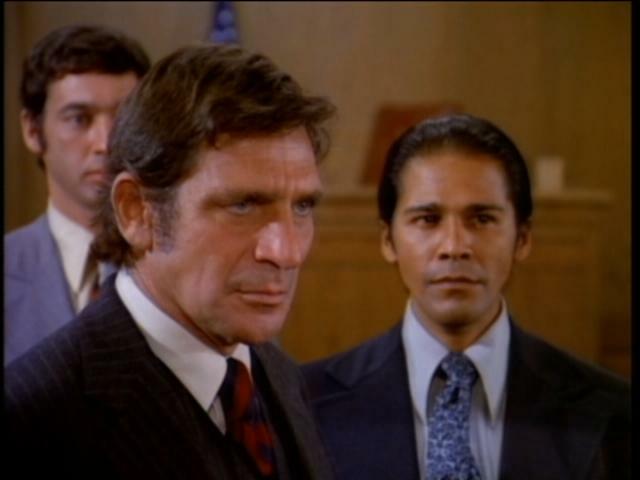 The judge hollers for the henchmen to help Cunningham but before they can move, Lt. Rossi finally makes it on the scene. Overall, this wasn’t a bad show, but if you’re expecting anything like the movies, especially the original Shaft (even with cleaned up language), forget it. This was clearly sanitized for television and has none of the New York City grit as the film does. The theme music is pretty well preserved but the opening of the episode looks like the opening for “The People’s Court,” and everything’s all pretty in the city. 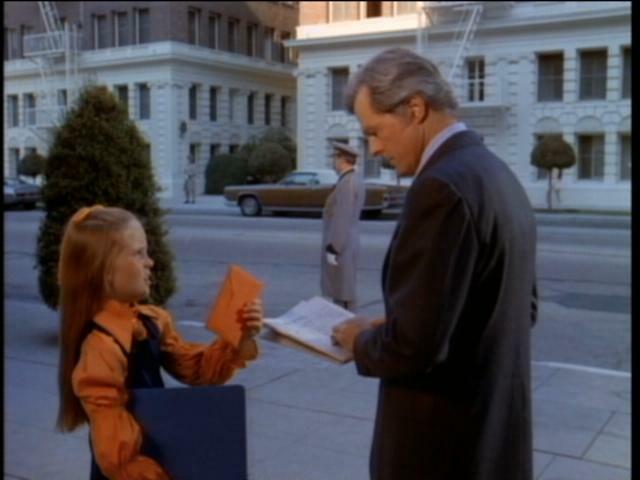 I’d even bet that, with the exception of some exterior shots, the episode wasn’t necessarily filmed in NYC. Shaft doesn’t even sport his classic leather duster here. Bummer. Also, with the exception of Shaft and one minor character, there are no other black actors in this. 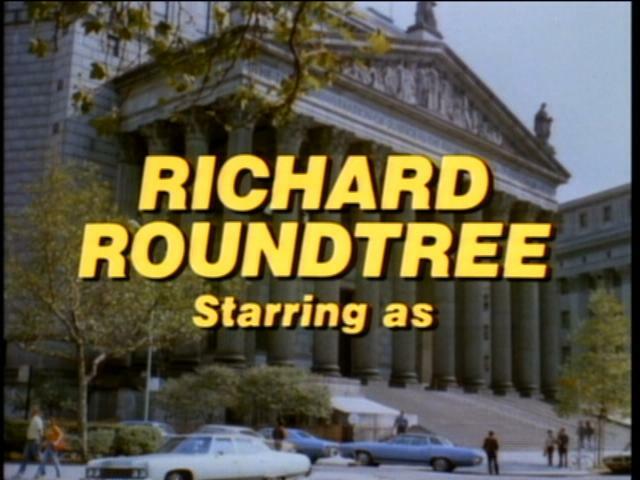 Honestly, if this hadn’t been Shaft with Richard Roundtree, it could have just been another white guy playing a PI on television. Additionally, I wasn’t impressed with some of the acting in this one. 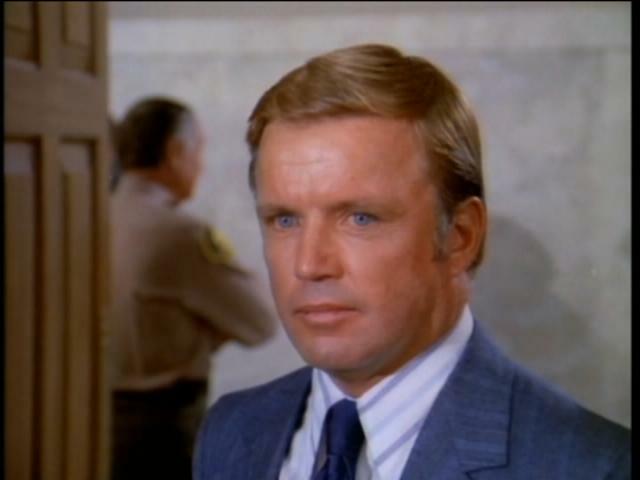 Richard Jaeckel as Sgt. 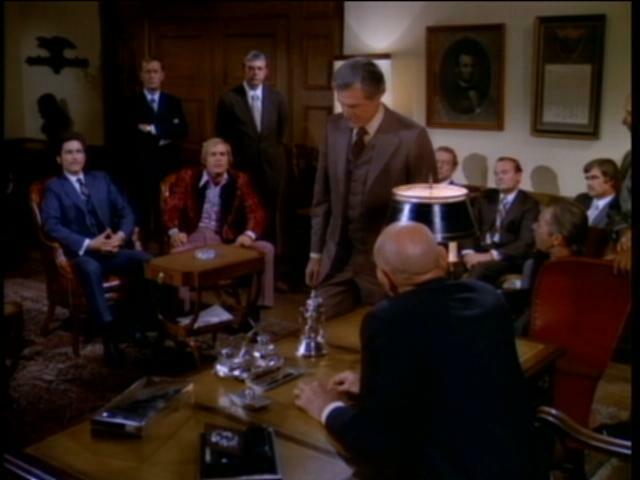 Turner is a little too stiff, Eddie Barth is okay as Lt. Rossi but I would have liked to have seen Charles Cioffi who played Lt. Androzzi in the original Shaft film here. 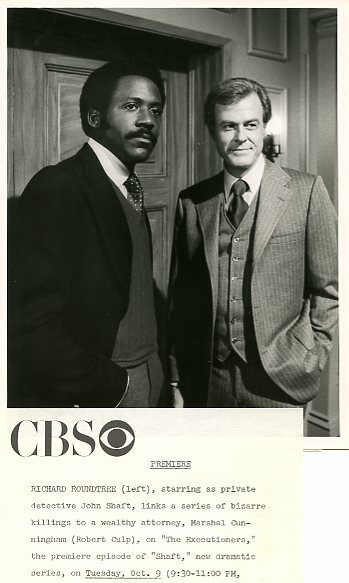 (Cioffi, for those of you playing Six Degrees of Separation Culp Style, was in the tv movie “See the Man Run” with Culp in 1971). Also the back and forth looks between Noah Keen and Rafael Campos after their abduction and when the committee finally arrives to see them, seems forced and excessive. Culp alone is worth watching in this one. Those familiar with his Columbo appearances will recognize the similar modus operandi here. Character carries extreme anger and rage but is cool and calm by all outward appearances – until something causes him to completely crack up. 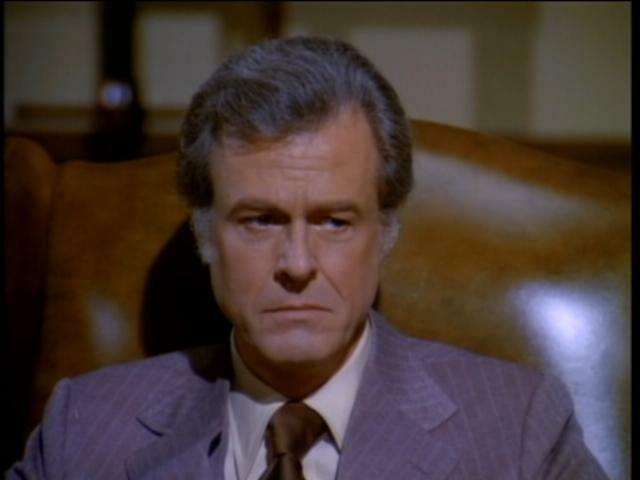 None of Culp’s guilty murderers on Columbo ever really snapped once they were nailed by the famed Lieutenant, but when Shaft dumps Sgt. Turner down the “garbage disposal” Culp is no longer the refined, cool, calm attorney. He becomes a wild eyed, snarling, basket case. Which is an excellent touch….to an otherwise disappointing scene. 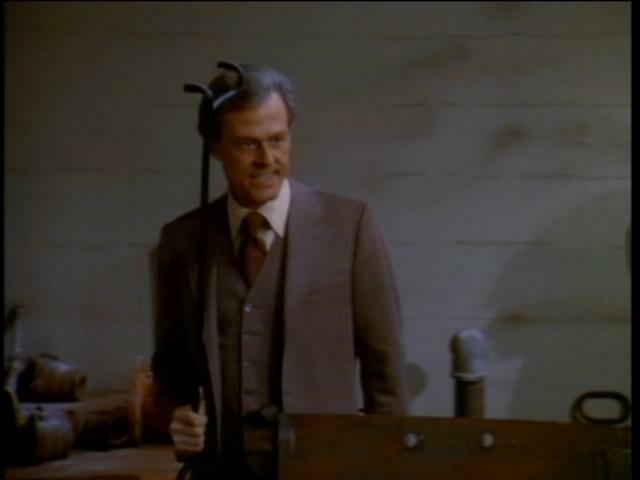 Culp’s Cunningham is wild in expression and looks capable of doing some real serious damage to Shaft, but instead we see a few feeble swings with the hook at Shaft who manages to grab it and wrap it around Cunningham’s neck. Then Lt. Rossi comes in to save the day. The St. Petersburg (Florida) Independent was just plain blunt. “It’s more than terrible, it’s a waste of time. 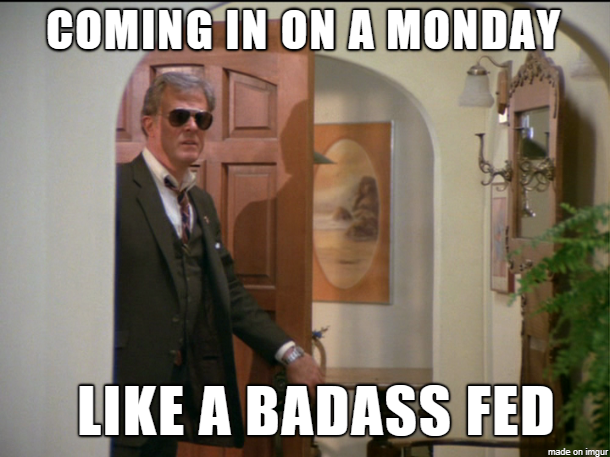 There are lots more fun things to do with the 90 minutes – watch the grass grow, count dog hairs in the carpet, read a good comic book….” (It must have been depressing to live in Florida in the 70’s based on the entertainment reviews I’ve come across on other Culp shows/films). The bright spot of the Independent’s review is they ran a photo and a CBS affiliate ad on the same page. The quality isnt’t great here, but there’s no mistaking what Culp photo was used. The best gem I found in my newspaper search? 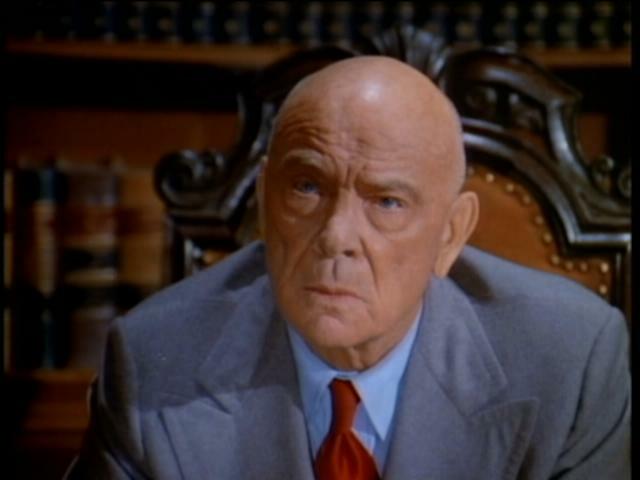 Noah Keen (Charles Dawson) – Veteran character actor who often played doctors, lawyers and police officers. Guested on many television shows from the 60s through the 80s. 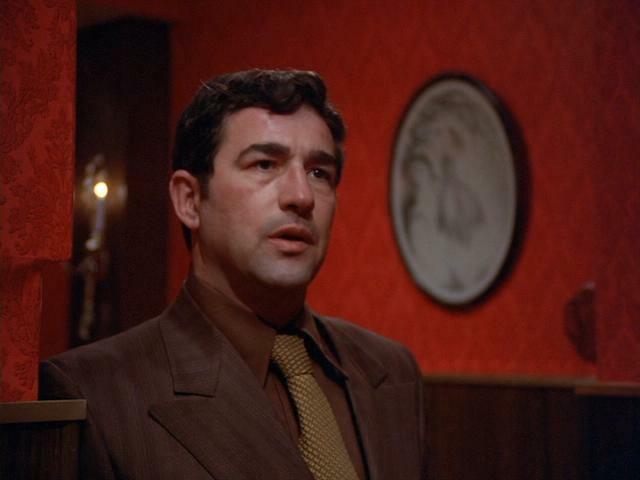 Ed Barth (Lt. Al Rossi) – has the interesting distinction of having been in the original Shaft movie as Tony, one of the mafia hoods guarding the kidnapped daughter of Bumpy Jonas. 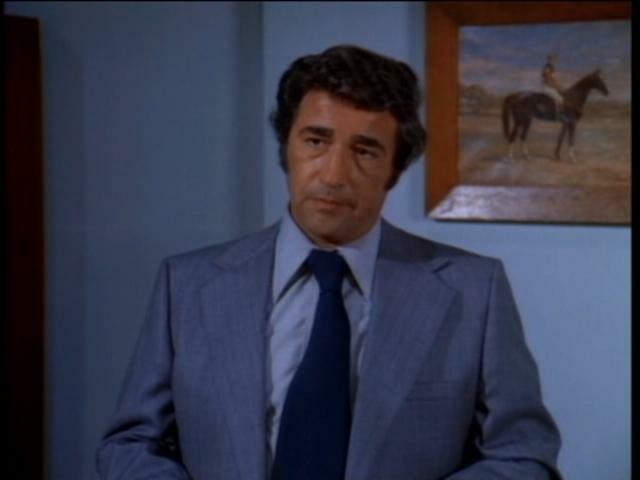 He also had a recurring role on Simon and Simon as Myron Fowler and appeared in films “The Amityville Horror” and “Fame.” If his voice sounds familiar then you recall the Miller Lite commercials from the 80s. And finally, Shaft was never seen driving a car in the original movie (he walked everywhere and I’ve always heard that a lot of New Yorkers walk to where they gotta go). 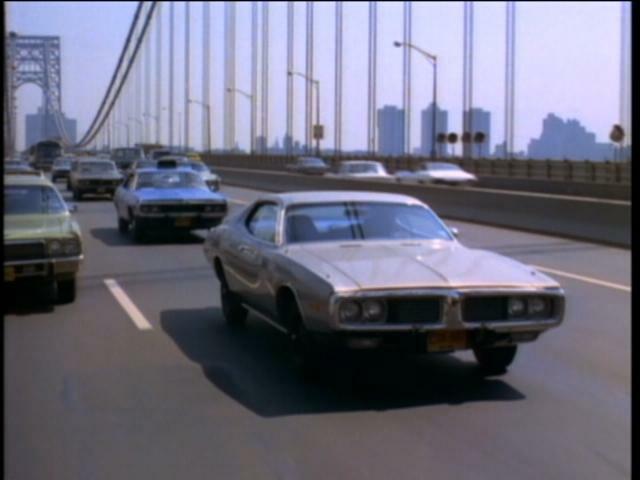 Here, Shaft gets a set of wheels, a grey nondescript 1973 Dodge Charger. “The Executioners” is available on the Shaft TV Movies complete DVD set, available from Amazon.com. Can you dig it?! Another great MGM release is being done via the Warner Archive MOD format: Shaft – The TV Movie Collection. The official release date is today, September 13. 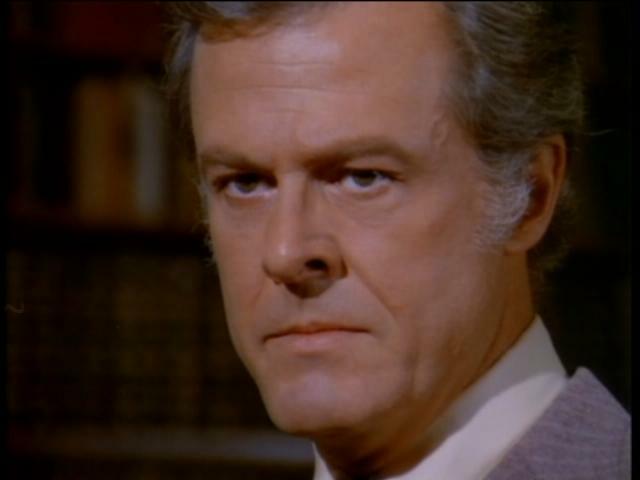 What does Shaft have to do with Robert Culp you ask? 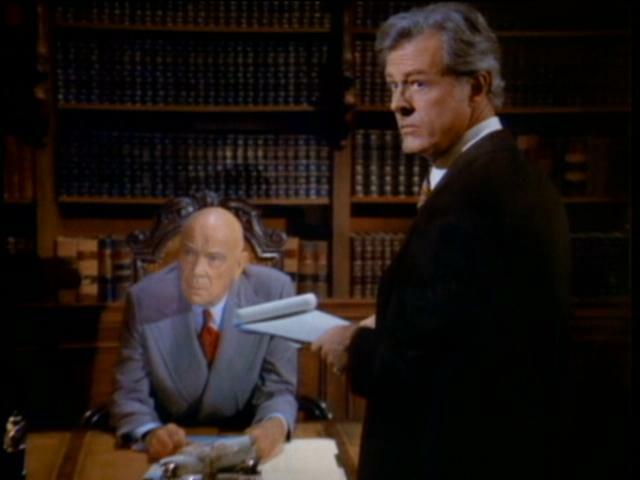 The very first of the tv films, “The Executioners” (aka “The Enforcers”) features Robert Culp as a guest star! Don’t let Culp’s smile fool you. He’s a bad moutha shut-yer-mouth in this one! I have seen the episode, but I’ll definitely be getting the DVD set to add to my ever growing Culp Collection. Yet another reason why I loooooove the Warner Archive! Thanks WB!